You’d think with all that room in the forest, they’d give each other space. I don’t mind though … makes it that much easier to collect. This is the pear-shaped puffball (Lycoperdon pyriforme), an edible mushroom that has the texture of a marshmallow. Cut each one in half to see how it looks – the closer to pure white, the better it tastes (cooked, of course). Another reason to cut each one open is to confirm that it is indeed a pear-shaped puffball. If it’s black inside, it could be a toxic Scleroderma mushroom. If it’s not pure white all the way through, and you see an outline of a developing mushroom, you probably have a poisonous Amanita. So, just to be safe … cut each one in half! 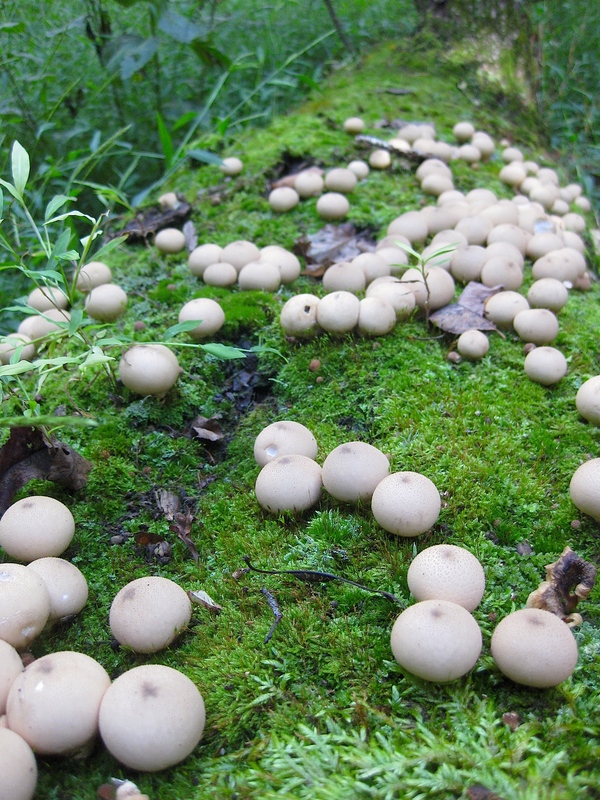 Look for the pear-shaped puffball scattered on logs and stumps throughout the fall (and the spent versions throughout the winter). And tell them Adam sent ya. This particular cluster was found about 15 miles outside of Pittsburgh, Pennsylvania in late September.